Berkery, Noyes & Co. represents the National Roofing Contractors’ Association in the sale of its annual trade show to Hanley-Wood, LLC - Berkery, Noyes & Co., LLC. New York, May 18, 2004 — Joseph W. Berkery, President of Berkery, Noyes & Co, LLC, announced today that Berkery, Noyes represented The National Roofing Contractors’ Association in the sale of its Annual Trade Show to Hanley Wood, LLC, the leading business-to-business media company serving the residential construction industry. Purchase price was not disclosed. The NRCA show is North America’s largest roofing exhibition, with close to 90,000 net square feet of exhibit space and 7-8,000 attendees in recent years. The exhibition showcases the latest products, materials, equipment and services relevant to the roofing construction and maintenance industry. The show’s education program covers topics such as strategies to thrive in difficult times, enhancing leadership skills, crisis planning, fleet safety management, and various industry technical issues. Attendees of the show are roofing professionals from around the world, including contractors, architects, building owners, consultants and other industry professionals. Exhibitors are the manufacturers, distributors and suppliers to this industry. The transaction closed May 18, 2004. 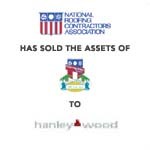 On the same day, Hanley Wood and NRCA entered into a 45-year sponsorship agreement making NRCA the official sponsor of the trade show. Hanley Wood Exhibitions will produce both the conference and the trade show during the sponsorship period and will work with NRCA to develop the show’s educational program. The NRCA annual meetings will continue to take place during the show, as they have in the past. Berkery, Noyes & Co., LLC represented the NRCA in the transaction. Berkery, Noyes specializes in investment banking for the information, publishing and communications industries. Among the most recent transactions completed by Berkery, Noyes are The Thomson Corporation’s divestiture of the assets of Sheshunoff Information Services (SIS) to Alex Information (AI), an affiliate of Alex Sheshunoff Management Services, LP, and Highline Data LLC, an affiliate of Spire Capital, the sale of Weaver Publications to Prospect Partners, LP, the divestiture of the McGraw Hill Companies’ Juvenile Retail Publishing Business to School Specialty, the acquisition by Taylor & Francis Group plc of Marcel Dekker, Inc., the sale of Cliggott Publishing and the Oncology Group to United Business Media and the sale of Forum Corporation to the IIR. Berkery, Noyes & Co.’s clients range from associations and small firms often seeking a buyer, to most of the major international information companies who use the firm’s expertise in locating, analyzing and negotiating with acquisition candidates and in managing divestitures. The firm operates with a staff of twenty-two professionals serving the information and publishing industry from offices in New York. For more information, visit www.berkerynoyes.com. Hanley Wood, LLC is the premier business-to-business media company serving North America’s residential and commercial construction industries. Through four integrated operating divisions, Hanley Wood provides industry-leading advertising, marketing and news/information services, including award-winning magazines; trade shows and events; marketing communications and brand-activation services; e-media sites and publications; and home plans publishing, distribution and retailing. Founded in 1976, Hanley Wood is a $180 million company owned by VS&A Communications Partners III, LP, the private-equity affiliate of media industry merchant bank Veronis Suhler Stevenson.